** The electron transfer theory could not explain the bonding in molecules such as H2, O2, Cl2 etc., and in organic molecules, that had no ions. ** It was G.N. Lewis who suggested that two atoms could achieve stable 2 or 8 electrons in the outer shell by sharing electrons between them. ** Let us consider a general case where an atom A has one valence electron and another atom B has seven valence electrons. As they approach each other, each atom contributes one electron and the resulting electron pair fills the outer shell of both the atoms. Thus A acquires stable 2 electrons and B, 8 electrons in the outer shell. ** The shared pair is indicated by a dash (–) between the two bonded atoms. A shared pair of electrons constitutes a Covalent bond or Electron-pair bond. ** In fact, the positive nuclei of atoms A and B are pulled towards each other by the attraction of the shared electron pair. At the same time, the nuclei of two atoms also repel each other as do the two electrons. It is the net attractive force between the shared electrons and the nuclei that holds the atoms together. The attractive force between atoms created by sharing of an electron-pair. 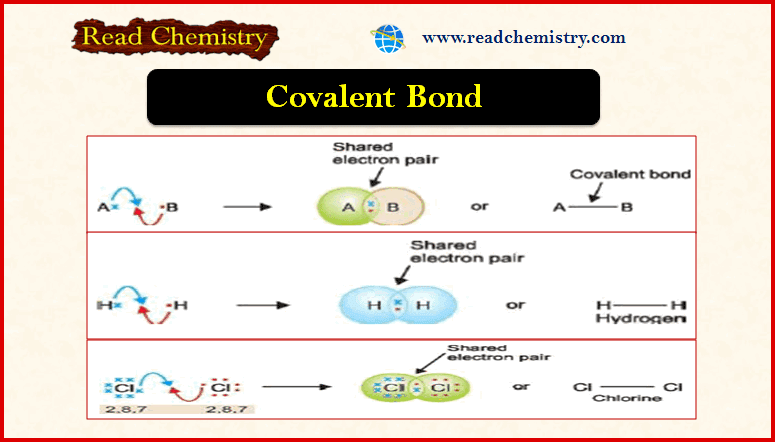 The compounds containing a covalent bond are called covalent compounds. Each of the atoms A and B should have 5, 6 or 7 valence electrons so that both achieve the stable octet by sharing 3, 2 or 1 electron-pair. H has one electron in the valence shell and attains duplet. The non-metals of groups VA, VIA and VIIA respectively satisfy this condition. The atom A will not transfer electrons to B if both have equal electronegativity, and hence electron sharing will take place. This can be strictly possible only if both the atoms are of the same element. The atoms A and B should have equal (or nearly equal) electron affinity so that they attract the bonding electron pair equally. Thus equal sharing of electrons will form a nonpolar covalent bond. Of course, precisely equal sharing of electrons will not ordinarily occur except when atoms A and B are atoms of the same element, for no two elements have exactly the same electron affinity. The construction of Lewis structures of simple covalent compounds will be discussed. Hydrogen molecule is made of two H atoms, each having one valence electron. Each contributes an electron to the shared pair and both atoms acquire stable helium configuration. Thus stable H2 molecule results. octet by sharing a pair of electrons. ** In many molecules, we find that in order to satisfy the octet, it becomes necessary for two atoms to share two or three pairs of electrons between the same two atoms. The sharing of two pairs of electrons is known as a Double bond and the sharing of three pairs of electrons a Triple bond. ** Let us consider some examples of compounds containing these multiple covalent bonds in their molecules. ** The above structure of oxygen implies that all the electrons in oxygen, O2, are paired whereby the molecule should be diamagnetic. However, experiment shows that O2 is paramagnetic with two unpaired electrons. This could be explained by the structure. molecules, it should be kept in mind that it is simply the representation of a theory. In this case, the theory just doesn’t work. The two atoms of nitrogen (2, 5), each having five electrons in the valence shell, achieve the octet by sharing three electron pairs between them. valence electrons). Thus the C atom and both the O atoms achieve their octet. While the atoms in a covalent molecule are firmly held by the shared electron pair, the individual molecules are attracted to each other by weak van der Waals forces. Thus the molecules can be separated easily as not much energy is required to overcome the intermolecular attractions. This explains the general properties of covalent compounds. The covalent compounds are often gases, liquids or relatively soft solids under ordinary conditions. This is so because of the weak intermolecular forces between the molecules. Covalent compounds have generally low melting points (or boiling points). The molecules are held together in the solid crystal lattice by weak forces. On application of heat, the molecules are readily pulled out and these then acquire kinetic energy for free movement as in a liquid. For the same reason, the liquid molecules are easily obtained in the gaseous form which explains low boiling points of covalent liquids. While the ionic compounds are hard and brittle, covalent compounds are neither hard nor brittle. There are weak forces holding the molecules in the solid crystal lattice. A molecular layer in the crystal easily slips relative to other adjacent layers and there are no ‘forces of repulsion’ like those in ionic compounds. Thus the crystals are easily broken and there is no sharp cleavage between the layers on application of external force. In general, covalent compounds dissolve readily in nonpolar organic solvents (benzene, ether). The kinetic energy of the solvent molecules easily overcomes the weak intermolecular forces. Covalent compounds are insoluble in water. Some of them (alcohols, amines) dissolve in water due to hydrogen-bonding. Since there are no (+) or (–) ions in covalent molecules, the covalent compounds in the molten or solution form are incapable of conducting electricity. 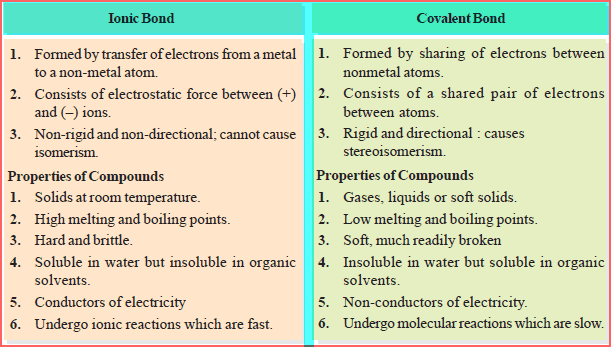 Covalent bonds are rigid and directional, the atoms being held together by shared electron pair and not by electrical lines of force. This affords opportunity for various spatial arrangements and covalent compounds exhibit stereoisomerism. The covalent compounds give reactions where the molecule as a whole undergoes a change. Since there are no strong electrical forces to speed up the reaction between molecules, these reactions are slow.